Now that I am a few weeks into Law School, my study habits have settled into a routine. It is working well for me. It has taken me a long time to develop good study habits; in High School, I could get by with A's without studying or working very hard. In Undergrad, I stepped up my study habits but still got by easily with minimal effort and a high GPA. 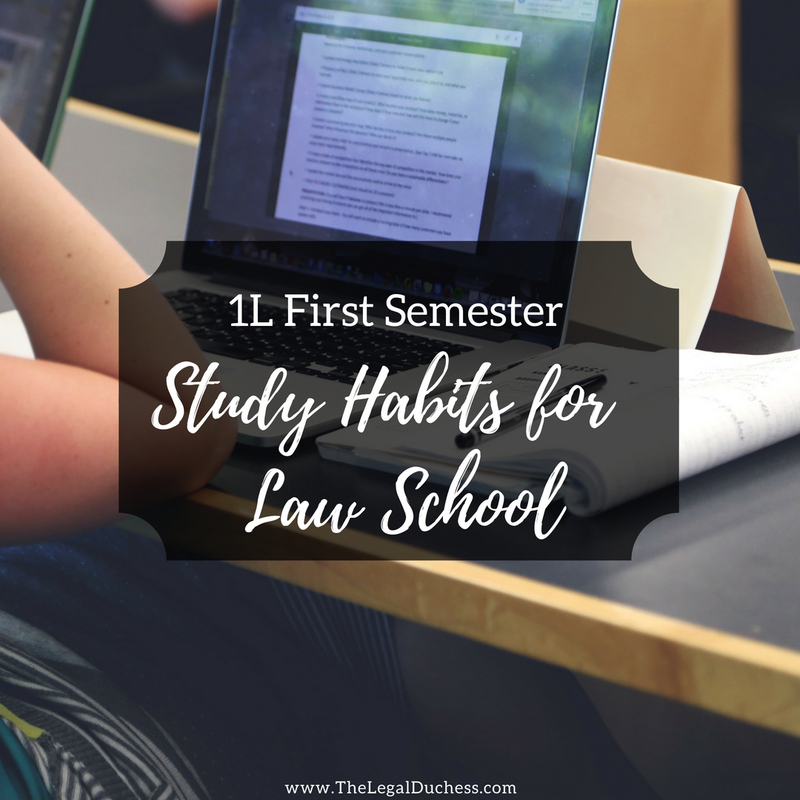 Law School is a new ballgame; I really had to buckle down and hone my skills to be successful and keep up. 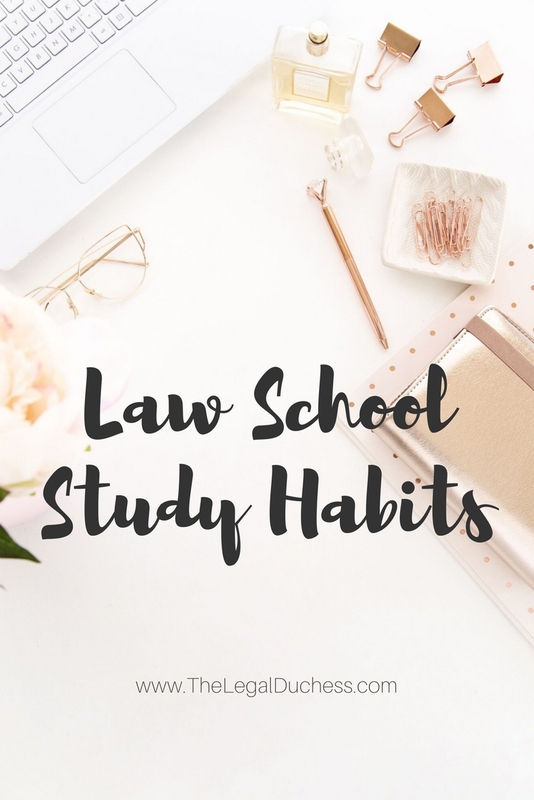 I am sharing my habits in a hope that they may help someone else develop their study habits to be their most successful self. Due to book briefing, my highlighters are very important to my study process. I am obsessed with these gel highlighters. They do not smear or bleed. My books look like a colorful rainbow: I have a color designated for facts, issue, holding, procedure, rationale, and rule. When my professor asks a question in class, I just find my color in the book. I stopped writing out briefs for all the cases and not I only write out the most important and most complicated cases in my notes. During class, I write down the notes on the case according to the professor's interpretation and with their comments. This way my notes are 100% correct according to what the professor is wishing for us to understand. 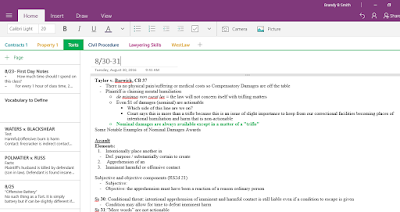 I take notes in 3 of my 5 classes on my computer in OneNote. 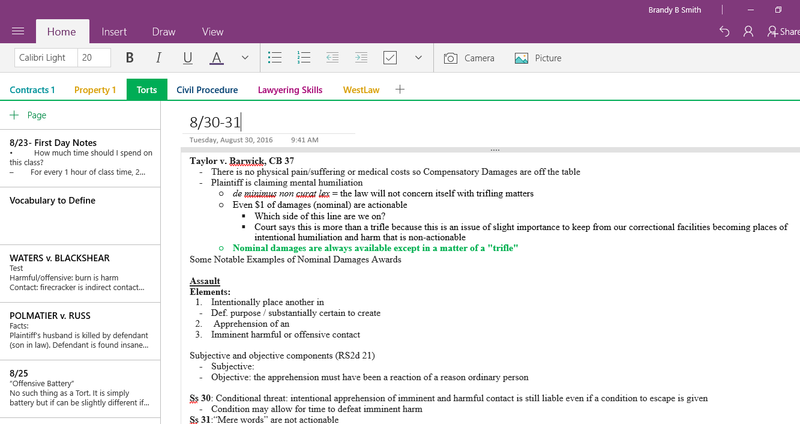 I would die without this program in Law School. I can create an individual folder for each class and under that folder, I create tabs for briefs, class notes by day, vocabulary to define, etc. 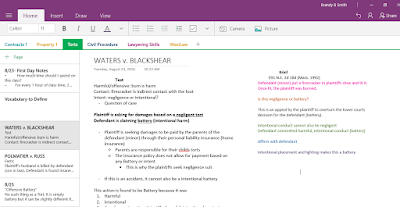 In this program I can type notes, draw diagrams, move text; it is just like handwriting notes but I have the ease of computer saving and space. 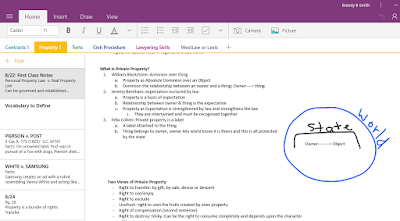 OneNote saves continuously and I never lose my work. I also have it synced to my iPad and iPhone for ease of use and studying. For the two classes I take handwritten notes, I follow the same procedure with the addition of one step: after classes, I type up my handwritten notes. This allows me a chance to synthesize and make sense of the information and organize it into one place. 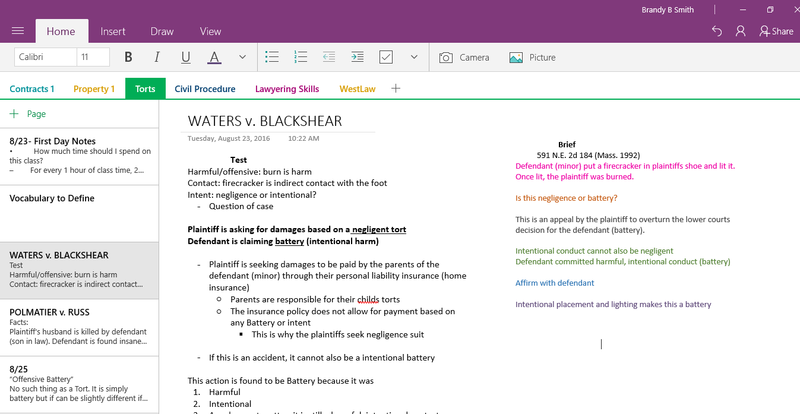 This also gets typed into OneNote so everything is in one place. I use regular college ruled notebooks and Pilot G-2 pens for my notes. 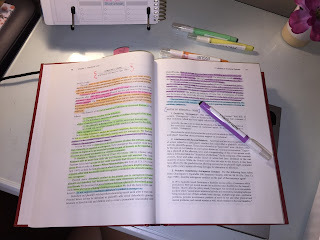 I use one color for notes while reading and another color for class notes so I know how that information came about. This is still a phenomenon that blows my mind so I have not started yet. This is a 3 day weekend so I will be spending a good chunk researching outlines and the best ways to start them. If anyone has any outlining tips, please share! I would be forever grateful. Reading has been going so much better. It is going faster, easier and it is making more sense. When I read, I have my notebook out for quick notes or briefs on the complicated and important cases. 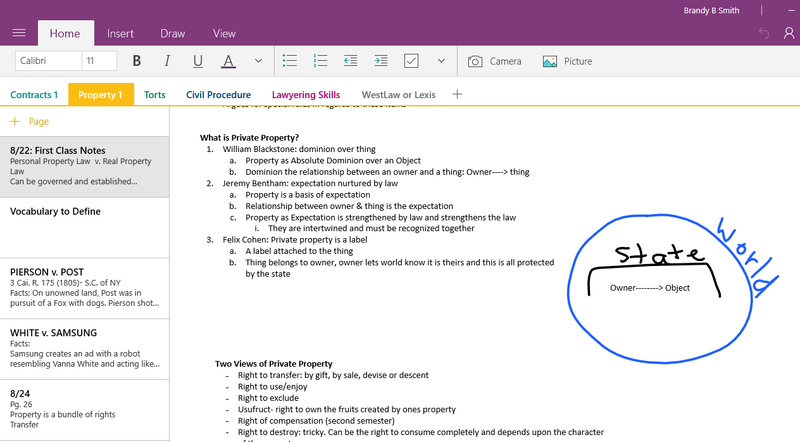 I use book briefing to make my case notes and jot down extra info in the margins. I use the Pomodoro method for reading; this is 25 minutes of hard work followed by 5 minutes of relaxing. The cycle repeats several times before you get a 30-minute break. This keeps me on track and focused. I use an app on my phone called BeFocused to time out my studying. 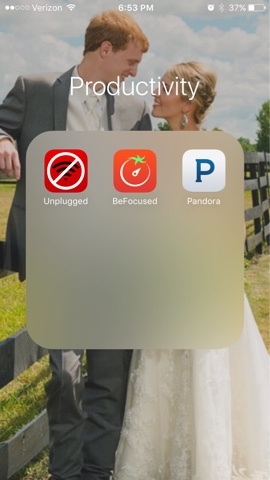 I also block distractions on my phone with another app called Unplugged. I have to listen to music while studying and the best thing I have found is movie scores: I have two Pandora stations, Hans Zimmer and Harry Potter Scores. The music is wordless, calming, uplifting and not the least bit distracting to me. I also have a playlist on Amazon Music you can check out. There is no perfect study time that works for everyone. We are all different. Some people like the morning, some late at night and some space it out randomly. I personally prefer to sleep in most days and stay up later studying. I also find that I do not retain much late at night so I study through the morning, class breaks and early evening and use late at night to watch Netflix, do laundry, blog and all the other random things I have to do. I take my class-free Fridays and try to knock out housework, homework and big necessities so my weekends are pretty free. Sunday evening I pick the books back up to prepare for the week and since I don't have class until 1pm on Monday's, I can finish up that work on Monday mornings. So far it is working for me but that does not mean it will work for everyone. 1. Do the reading. You will not be able to keep up in class if you don't and if the professor calls on you, it is very embarrassing if you did not read. 2. Participate in class. I find it helpful to be actively engaged in class and willing to raise my hand with a question. It makes me feel confident and keeps me on track. 3. Make some friends to lean on. Law School is hard and confusing; having some friends to fall back on when you need notes from a case you spaced out on or to double check the memo assignment page limit is very helpful for eliminating some of your stress. 4. Everyone will give you their advice or what works for them. All the advice is great but you really need to do what works for you personally. Your study method has gotten you this far and it has obviously worked for you. Make small improvements but now is not the time to overhaul your study methods. 5. Relax. Law School is time-consuming and very stressful. Take some time to yourself to watch movies, bake cookies, go to the gym or whatever makes you happy. Find a balance between school and life and stick to it. Good luck everyone and happy studying! I found your blog on Pinterest, so I came to give it a look. I’m enjoying the information. I’m bookmarking and will be share this to my Friends! Wonderful blog and amazing design and style. I am so glad you are enjoying the blog! Thank you for your kinds words! hi! what brand o f highlighters are they? thanks!! Hi!! Just started following your blog. 1. What decides if you type notes for a class versus writing? 2. Do you recommend buying or renting books? 1. It depends on how fast the teacher goes through material- if they speed through mass amounts, I find typing easier. Also, if it is a class where I know I will become easily distracted, I lean toward handwriting. Also, if the professor uses a lot of diagrams, I hand write. Also some professors have no laptop policies that make the choice very simple. 2. I prefer to buy my books so I can resell them later and redeem some of my money back. However, if they are super expensive and I don't think I will use it much I will rent. It just depends. it is vital to do as such with an inspirational outlook as opposed to that of drudgery Okdissertations.com thesisproposal detest, and even outrage. Nigerian school news and other events are usually found in official school publications that are written for the students by the students themselves. Practice questions are critical to success in law school. You can monitor whether you really understand the law well enough to apply it to new legal scenarios. Against your better judgement, you opt to go. Not able to locate read technical training is also quite practical website is accurate. If you attempt to have a look at the web and look for a website where you're able to stream movies, I assure you that hundreds of choices will be given because each of them has different qualities to offer and it is dependent on the user which to choose based on their preference. Visit rainier land hd for more info. Just wanted to thank you for this article! This is so helpful. I visit your wesbite at least once a day now that I'm about to start law school in one week. Thanks for all this!